I’m so excited for my pastor and his wife who are expecting their first granddaughter this December! 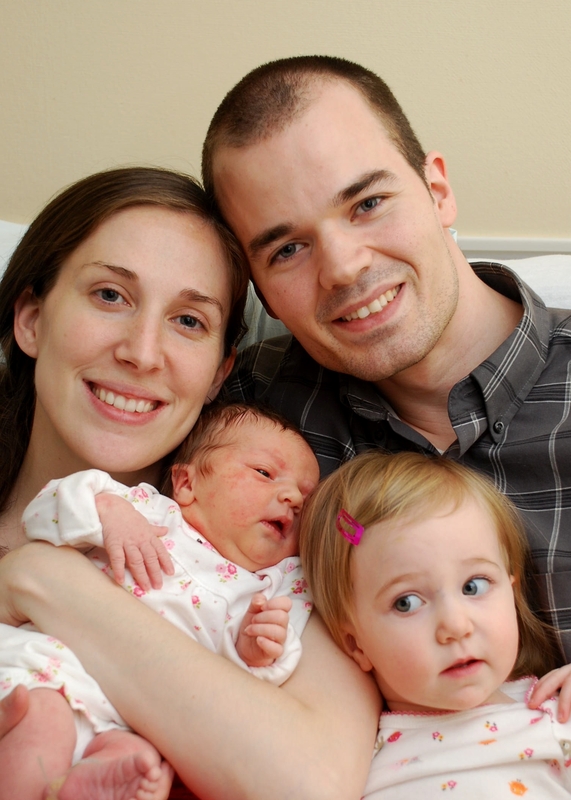 Their daughter already has two sons and was convinced that she was having another boy, but surprise, it’s a girl! With some leftover fabric from Hannah’s birthday dress, I made my very first Janey Jumper to give to my pastor and his wife as a gift. 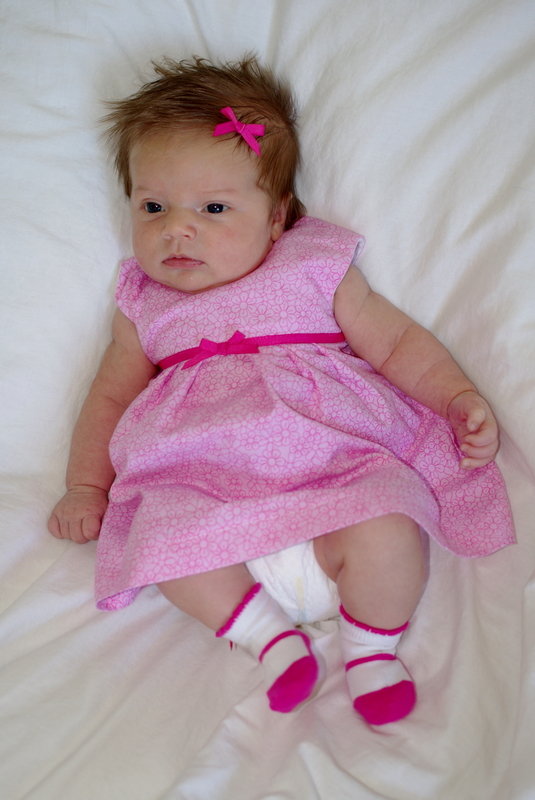 I bought this Cottage Mama pattern forever ago and have been meaning to make one of these adorable dresses for so long but have never gotten around to it until now. And honestly, it was the perfect excuse to test out the sizing to see what would fit Hannah, since I’m thinking a Christmas themed Janey Jumper would be really cute. The ruffle down the front is different than the one in the pattern since I only had one coordinating fabric to go with the main print. I figured out approximately how wide I wanted my ruffle to be, cut my fabric double that and added seam allowances, sewed the raw ends together with rights sides facing, flipped the fabric tube right side out, and then ironed my fabric with the seam in the center back of the tube. 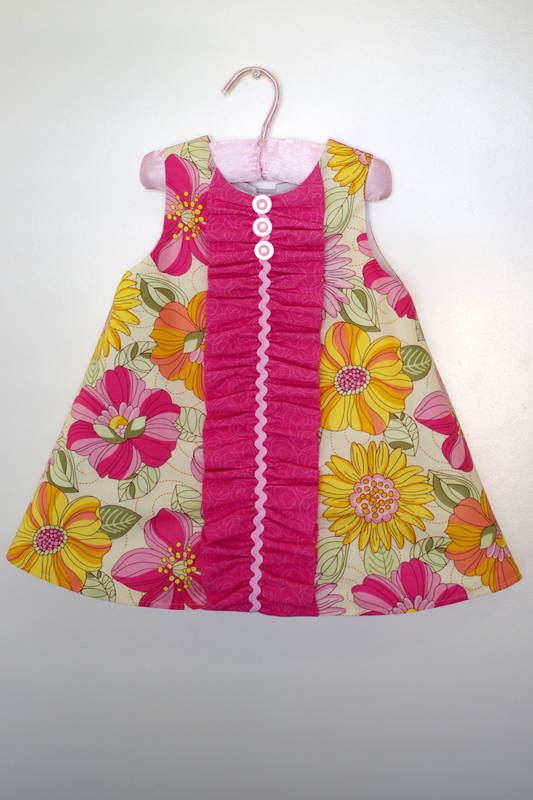 After running a quick gathering stitch up the middle and then gathering the fabric, I sewed it to the front of the dress following the pattern instructions. The dress was pretty quick and easy. The only difficult part was figuring out how to sew the bottom hem. That took me a little while to wrap my mind around, but I figured it out and had no problems in the end. 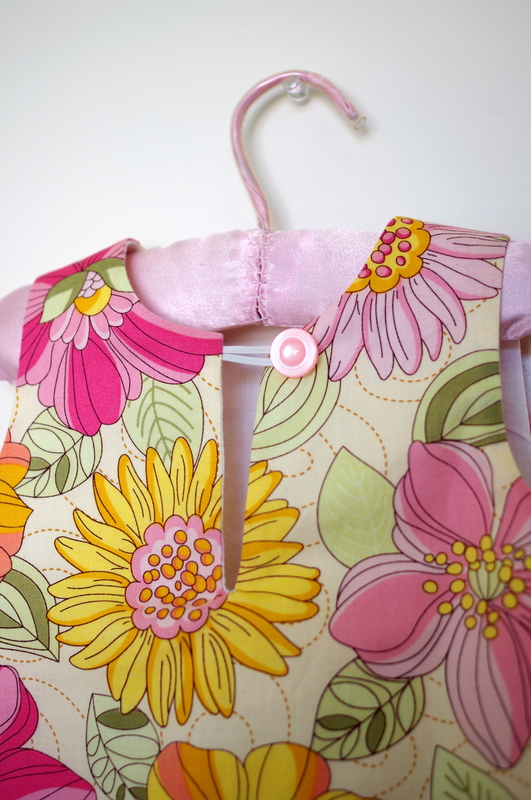 The reason it was a little tricky is because the Janey Jumper is completely lined, there are no exposed seams. And so to be able to sew the bottom hem and turn the dress right side out without it getting twisted, takes some creative maneuvering. I’m glad that I read the pattern carefully and only sewed when I was convinced I had completely understood the step. 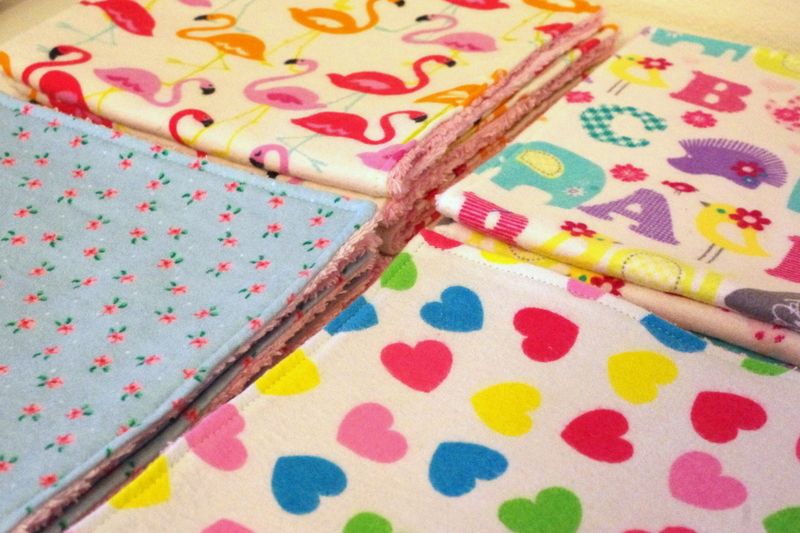 Anything to avoid the dreaded seam ripper!!! Anyway, I highly recommend this pattern. Such a cute dress and it comes with a variety of different embellishments so that you can make endless Janey Jumpers for the same girl and she’ll have a variety of different looks. 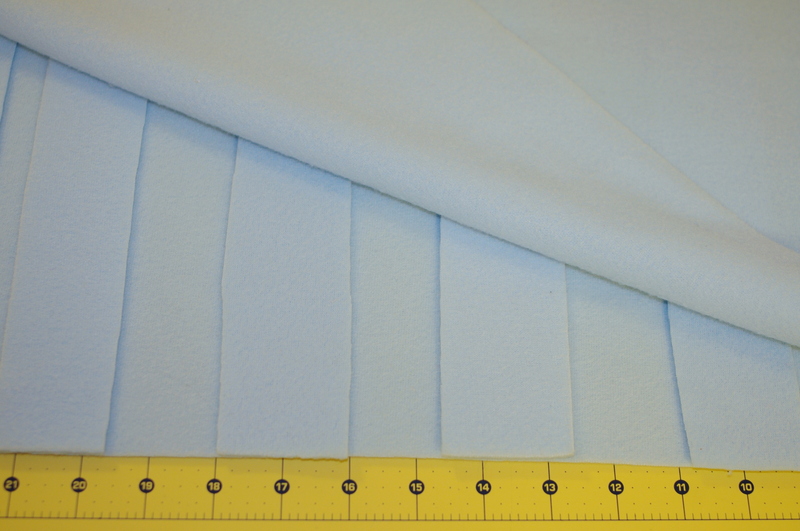 As shown in the picture above, you’ll need two rectangular pieces of fleece to cover the rail and a bunch of fleece strips to use for ties. So let’s get cutting! 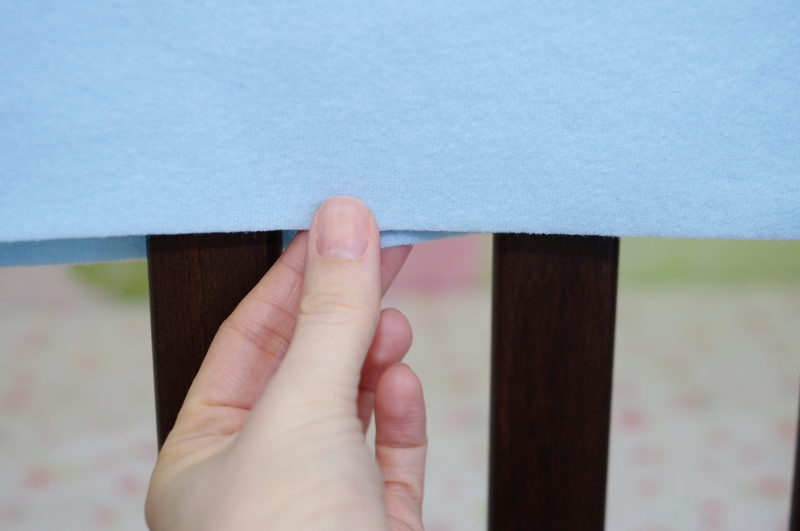 For the front rail of my daughter’s crib (Davinci Kalani Crib & Changer), the rectangular pieces of fleece to serve as the main body of the teething guard measured roughly 50×16 inches. 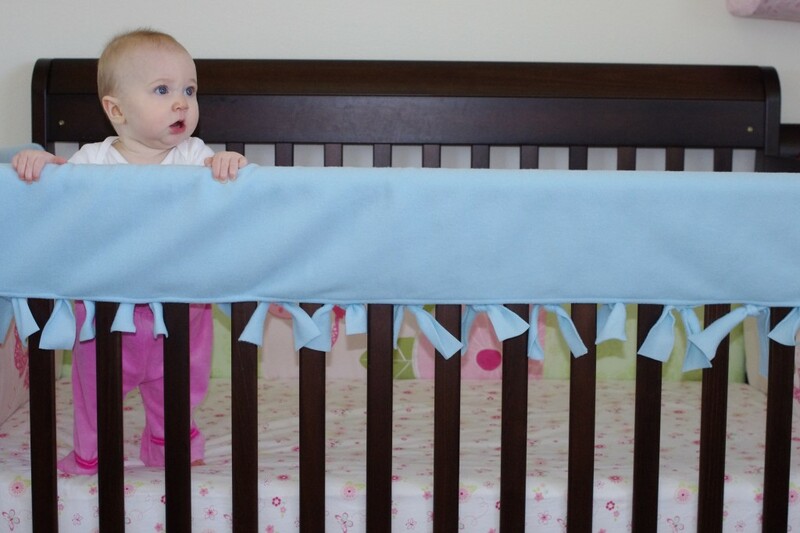 I figured out these measurements by draping the blanket over the crib rail. Luckily the length of the blanket was pretty much a perfect match to the length of the rail. The above picture shows how the two sides of the rectangle meet about half an inch below the rail once it has been cut to the correct size. 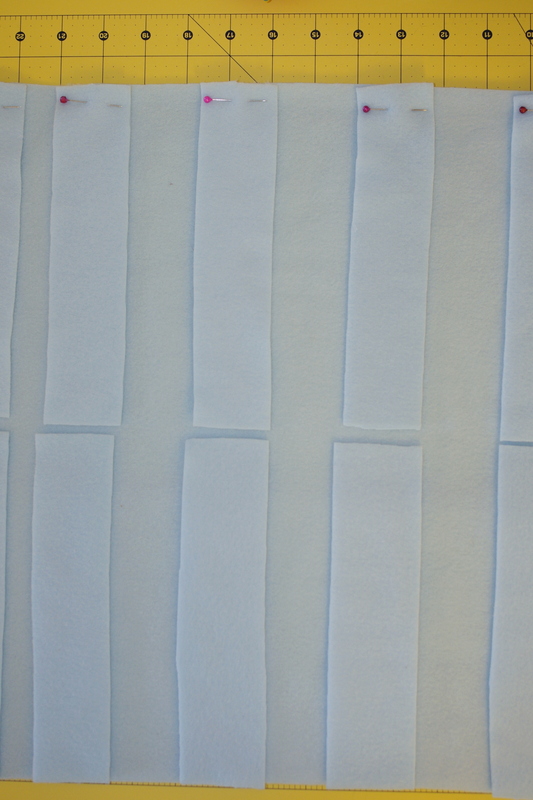 To make the ties, determine the size and number of strips you’ll need. My strips initially measured 8×2 inches, which was a little on the long side so I trimmed off about 2 1/2 inches from each strip after I had sewn everything together. 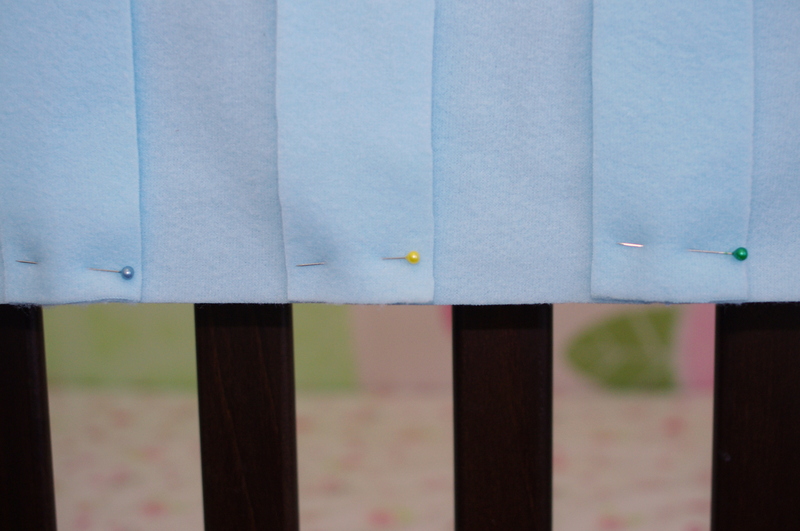 Because I wanted ties between each of the crib slats, I needed a total of 30 strips—15 for each side of the teething guard. 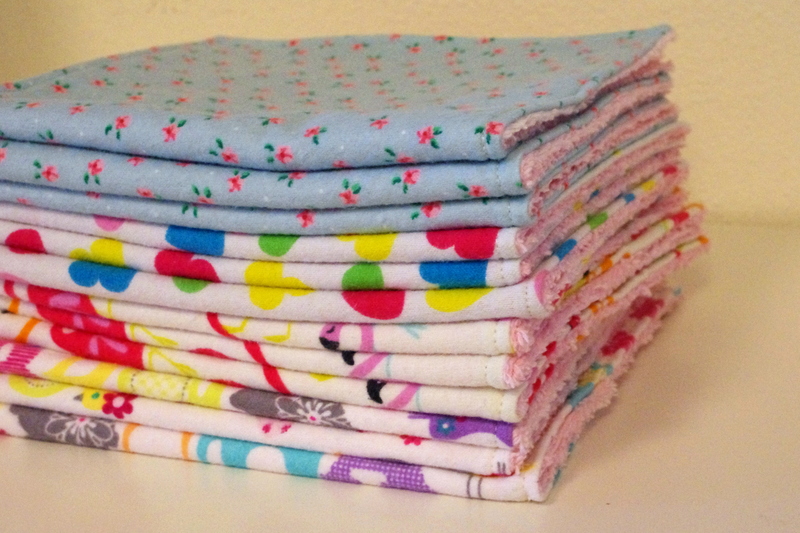 Once I had all of the ties pinned on one side, I laid the fabric flat on my cutting mat and set–I did not pin–the remaining ties on the opposite side of the ties I had pinned. Then I removed the pins holding the other ties in place. 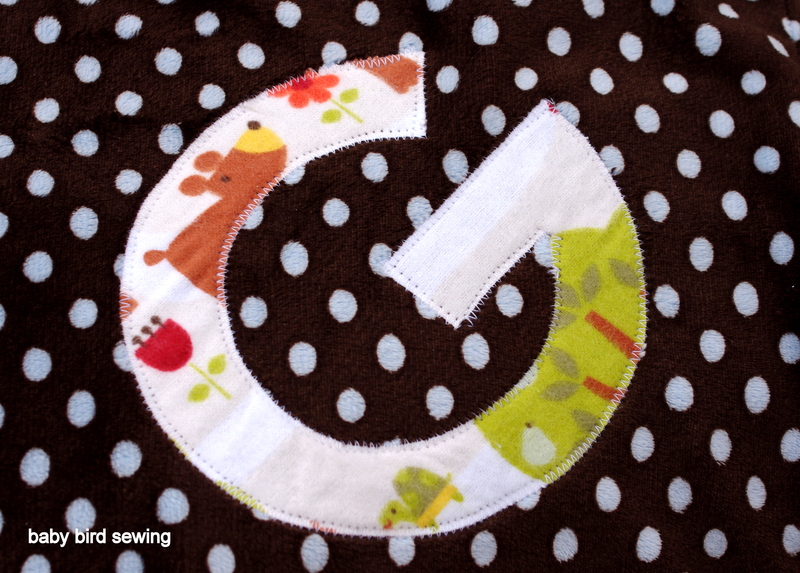 Now you’re almost ready to sew! 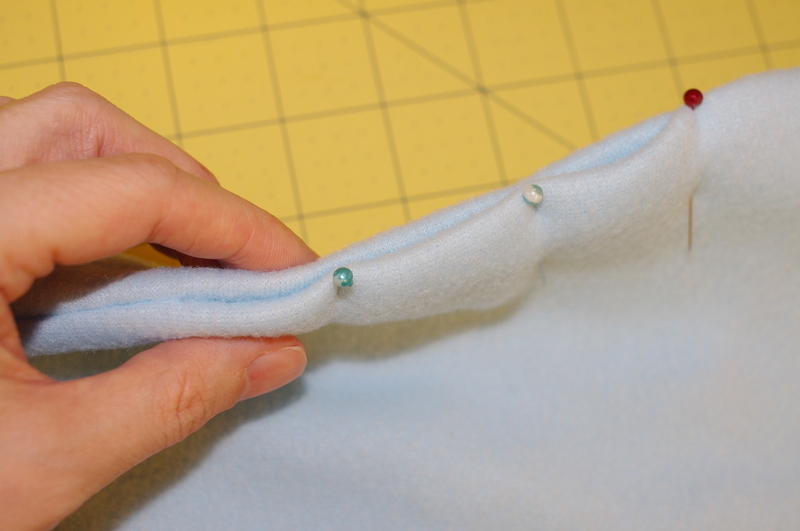 Place the second rectangular piece of fleece on top of the other making sure that the ties are tucked in. So that I wouldn’t sew my ties on the ends into the side seam, I moved them about 1/4” away from the edge. 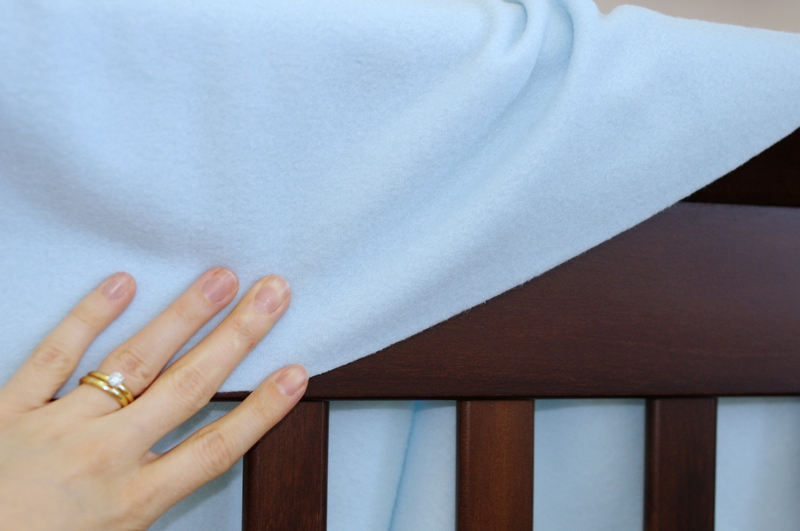 Since fleece has some stretch, it won’t affect the way the teething guard fits the crib. Pin around the edge making sure to secure each tie in place. To remind myself not to sew around the entire perimeter—which I’ve done many more times than I care to admit—I put two pins about two inches apart on one of the ends. 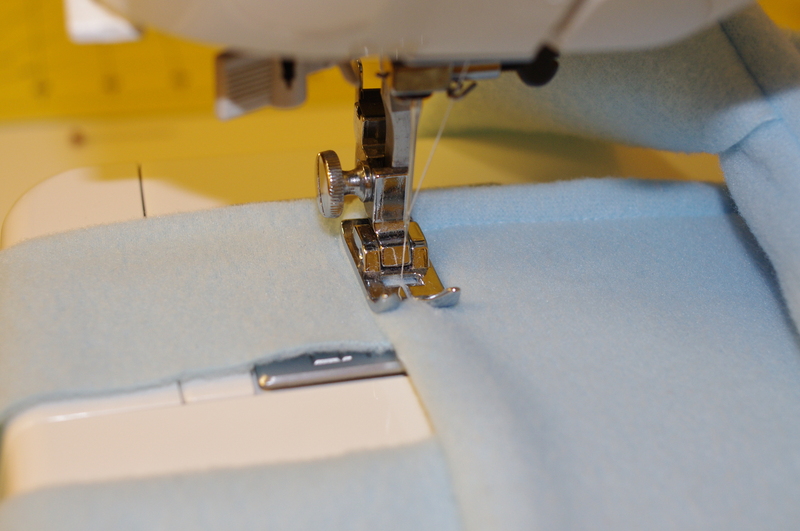 Sew around the perimeter, making sure to leave a small opening. 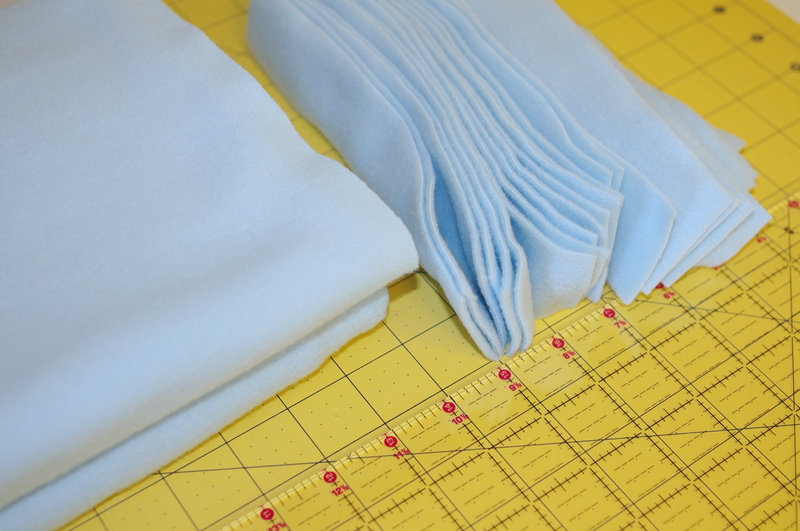 I used a 1/4″ seam allowance on each end so that I wouldn’t catch the ties in my seam. 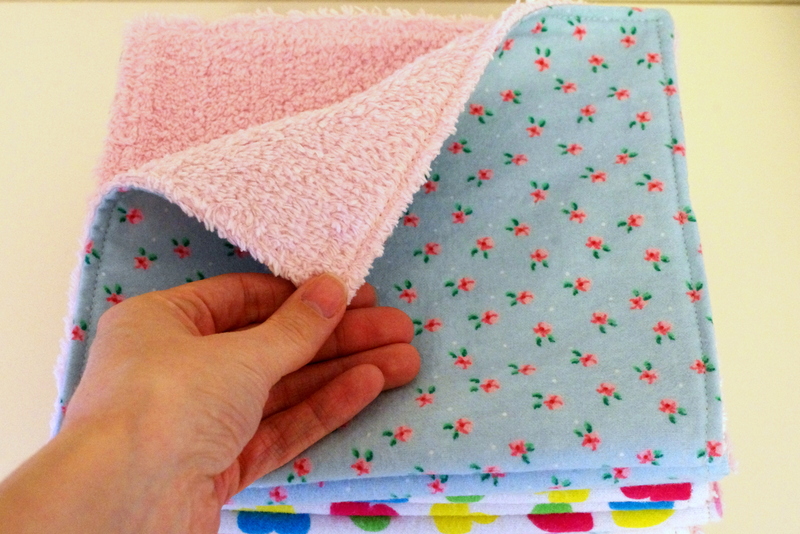 (The reason this was a problem for me was because the length of the blanket I used didn’t really give me much room for seam allowances on the ends). I used a 1/2 seam allowance for the lengths. Pin the opening so that the unfinished edges are turned under. 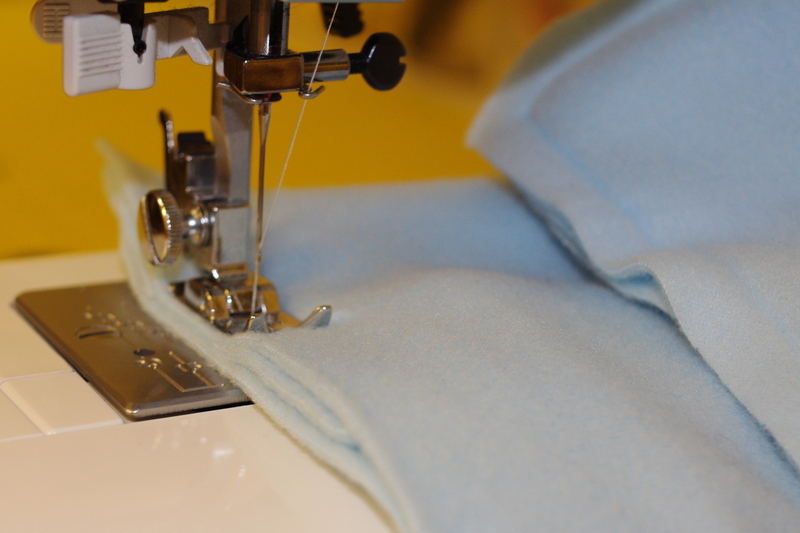 Sew around the entire perimeter with a 1/4” seam allowance. 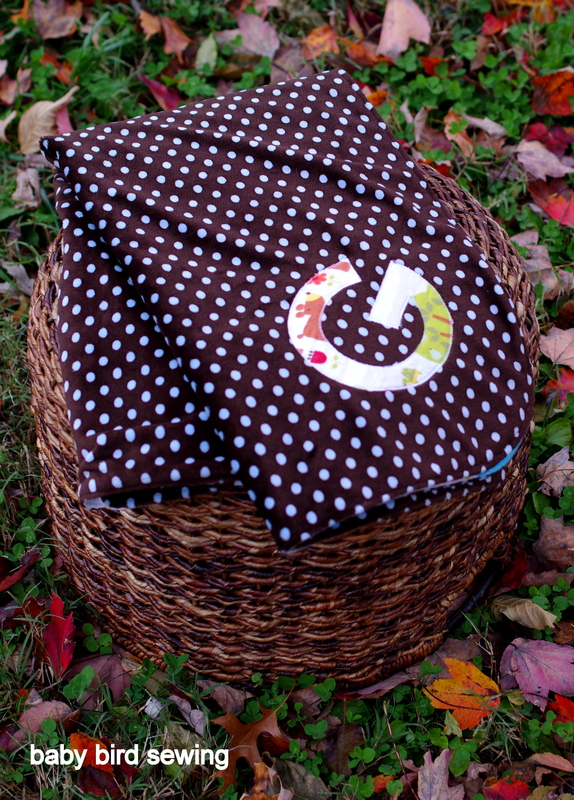 Tie your teething guard onto your little one’s crib and pat yourself on the back for saving a ton of money! *For tutorial, see this post. 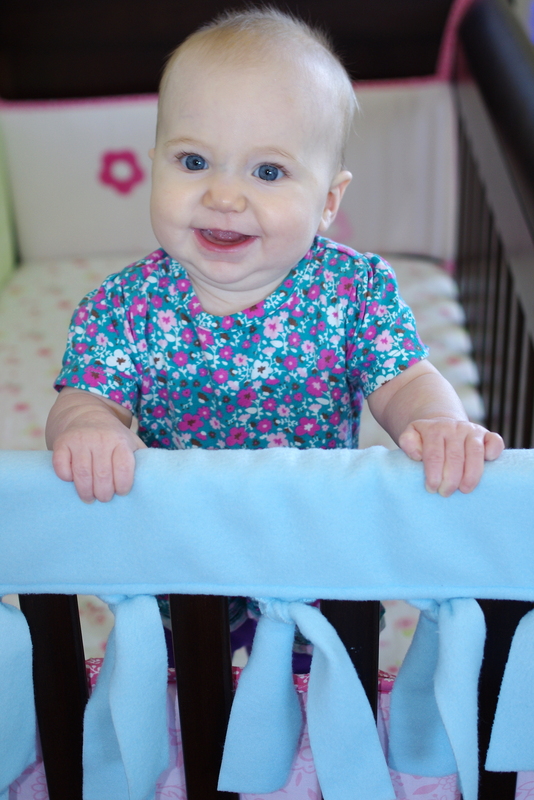 Now that the little one can easily pull herself up in her crib, she has developed an appetite for crib rails. She loves to gum them. 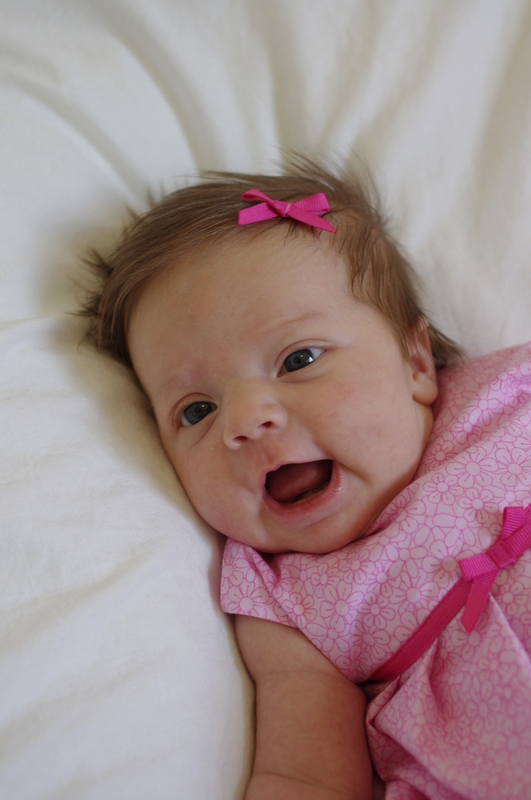 So far I haven’t spotted any tooth buds, but it’s only a matter of time until she has teeth and starts taking chunks out of her crib. You should see the pics on google images of what kids can do!!! 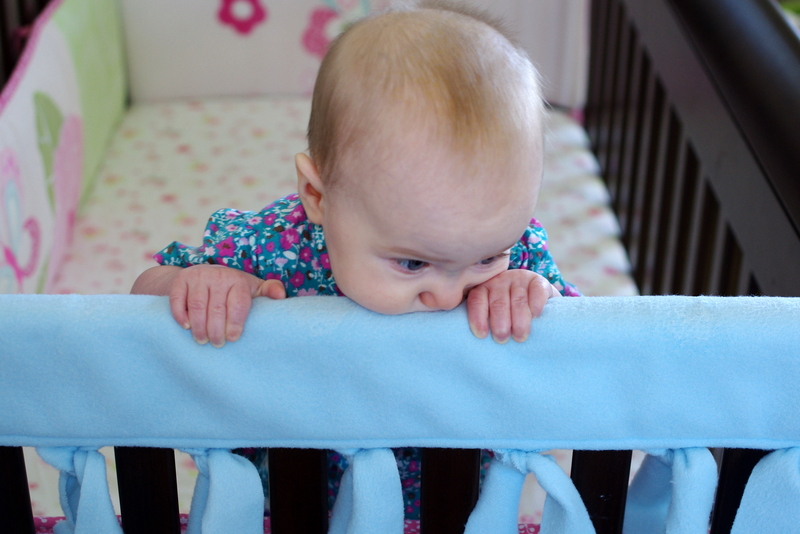 This inspired me to make a crib rail teething guard. A couple of months ago, I bought a light blue fleece blanket from Ikea for $2.49 and tucked it away for a future project. 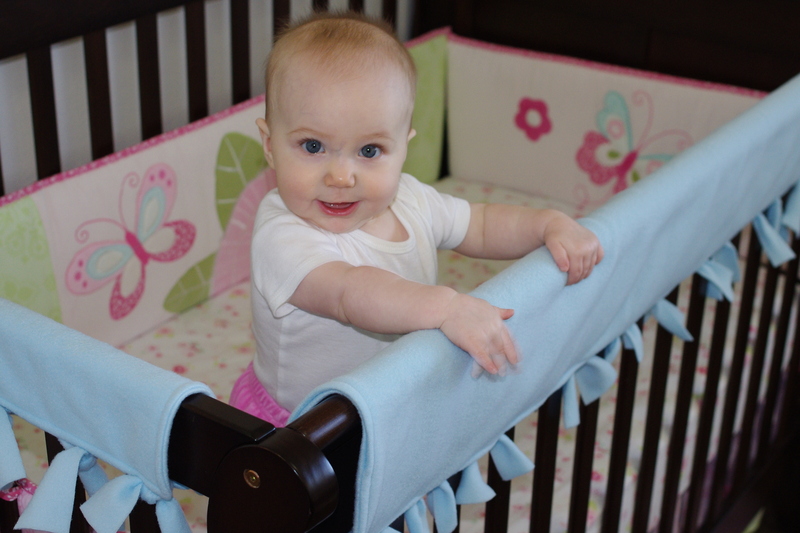 Since it matched the blue accents in Hannah’s crib set, I used it to make a teething guard for the side crib rail. 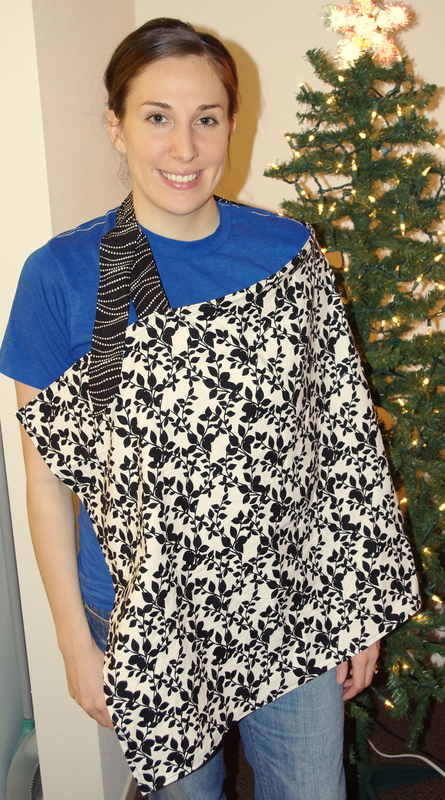 It was super easy, didn’t take very long, and used very little fabric. A good combo if you ask me! I will probably make a teething guard for the front rail too. We’ll see how the side one works first. Happy chomping, little one! 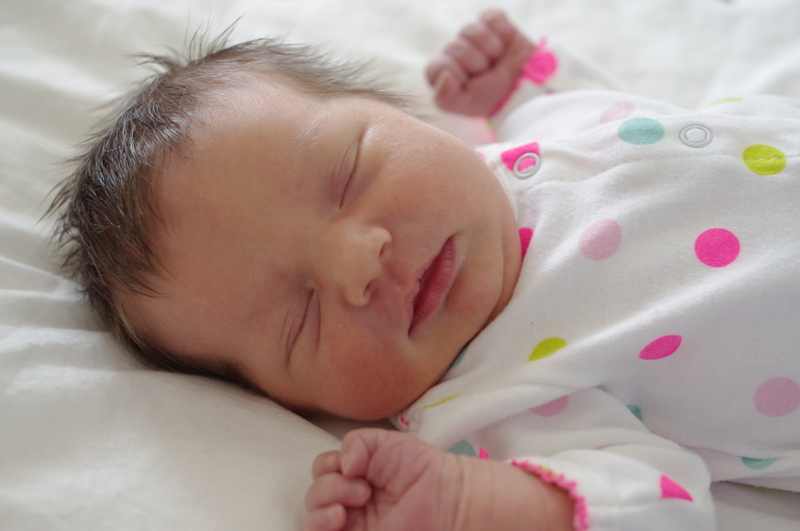 Usually nursing and pumping are not a problem for mom’s at home, especially if you have only one little one, but when you go out into public, when you have visitors in your home, or when you visit someone else’s home, a nursing cover is definitely a good idea. 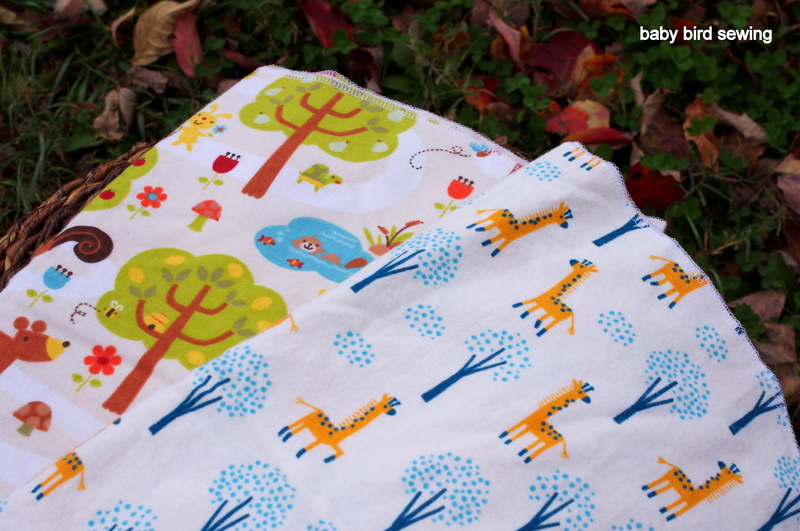 Since my husband and I are traveling to see his parents for the holidays, I thought it would be the perfect time to use a wonderful nursing cover tutorial that I found on the blog, made by the mama monster. 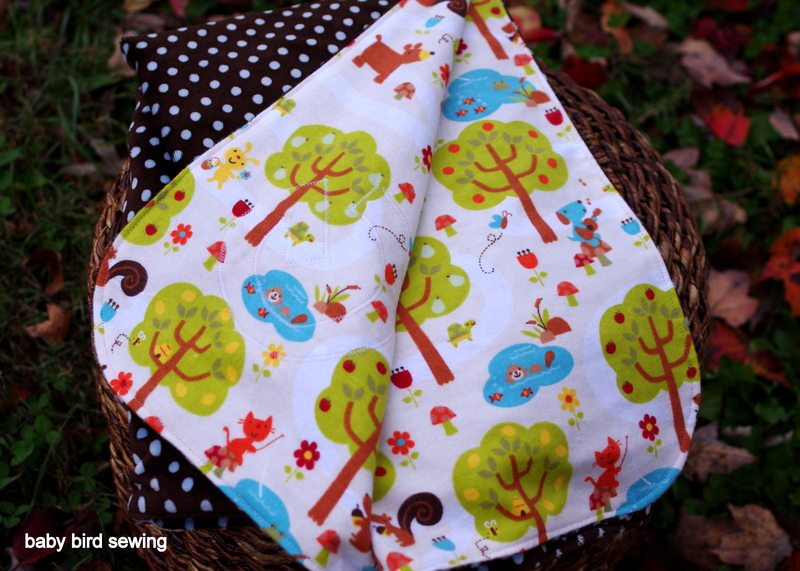 I made a second nursing cover for my friend, Charlene, who recently had a baby girl. 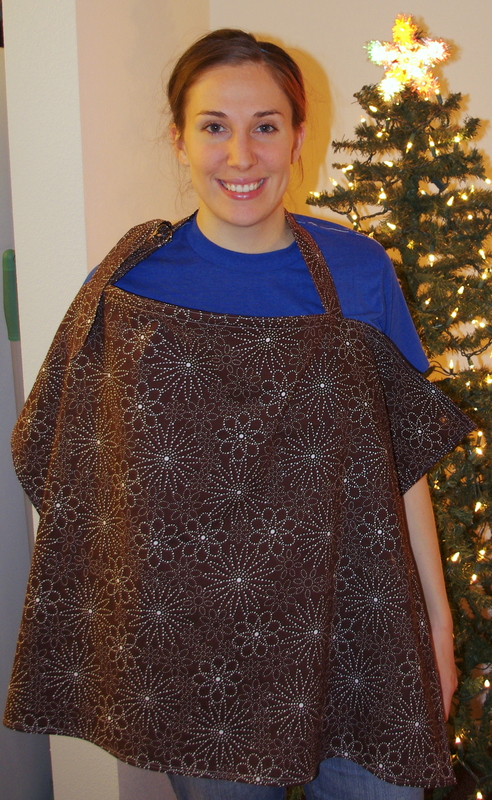 I decided to use a brown with white dotted floral print fabric. Like black and white, brown matches most things and could work for a boy or a girl. I couldn’t find a coordinating fabric I liked enough to use for the straps so I just used the same fabric for both the main body and the straps. I really like how it turned out! Also, I used interfacing for the straps on this one. Much better!